on the woodside. : *repeat performance. Have you ever had dinner with a food blogger? Your grocery budget increases two-fold. I have to admit, sometimes I don't reveal exactly what we're having ... I'll say things like, "pasta," when what I really mean is "pasta with some new and weird sauce that you're probably not going to like." You never get to eat the same thing twice. This one is particularly trying for my sister. She's always perfectly gushingly complimentary (unless something is truly terrible, or even inedible—we won't talk about that olive pasta), but that means that there are things she likes. Things she'd like to have again. I rarely ask for her menu input, in fact, because she's likely to say, "That thing you made that time!" I don't want to make that thing I made that time. I want to make something NEW. Not obnoxious at all, right? But this time she'd been really desperate for this Roasted Brussels Sprout–Potato Hash with Chicken Sausage. She'd asked me to make it more than once, and I just couldn't continue begrudging her—after all, I love it, too! But it was a cool fall day and I wanted something a little more comforting, something that would fill me up with a crisp, doughy crust and melty cheese: I wanted a calzone. 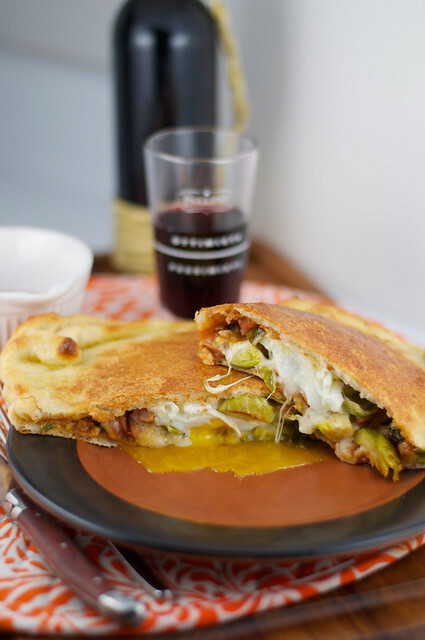 The original recipe calls for a fried egg on top, something to give the earthy hash a bright, velvety finish, so I decided I would try to incorporate that into the calzone, too. I was really flying blind; I couldn't find many helpful examples of how an egg behaves when you bake it inside a calzone, so I basically winged it. I really really wanted to maintain that oozing yolk—fully cooked egg gives me a sad. But the discombobulating thing about attempting it is that you're essentially blindfolded; the beautiful dough gets pillowy and puffed and golden, and you haven't a clue what's going on inside. The trick, I think, is to pan fry the egg until the bottom is JUST SET. The whites on top will still be raw when you transfer it (caaaaaaaaaaarefully) atop the hash and fold the dough (carefully) over. I am a carbohydrate fiend but not a crazy person (ahem), so I did omit the potatoes for this one. I just roasted the sprouts and the sausage (Andouille this time, instead of chicken-apple) together, sprinkled on the grated cheese, delicately laid out the egg, and popped the whole shebang in the oven. When it comes out, you can cut it in half and eat it almost like a piadine, using the crimped outer edges as a vehicle for mopping up any gooey egg yolk left on the plate. Here's to making something old new again. 1. Preheat oven to 400 degrees. Place Brussels sprouts on an aluminum foil–lined baking sheet; drizzle lightly with olive oil; toss. Add sausage to pan with Brussels sprouts. Roast 20 minutes or until sprouts are tender and sausage is browned. Remove pan from oven, and let cool slightly. 2. Line a second baking sheet with aluminum foil, and spray lightly with cooking spray. Unroll pizza crust onto baking sheet, and cut dough in half crosswise. Top each dough rectangle with Brussels sprouts, sausage (you may have mixture left over), and 2 ounces each cheese. 3. In a small skillet, lightly fry eggs until whites are just set on the bottom but not cooked through. Place 1 egg on top of cheese on each calzone. Fold dough edges over carefully, pinching to seal. 4. Bake calzones 12 to 15 minutes or until crust is golden brown. 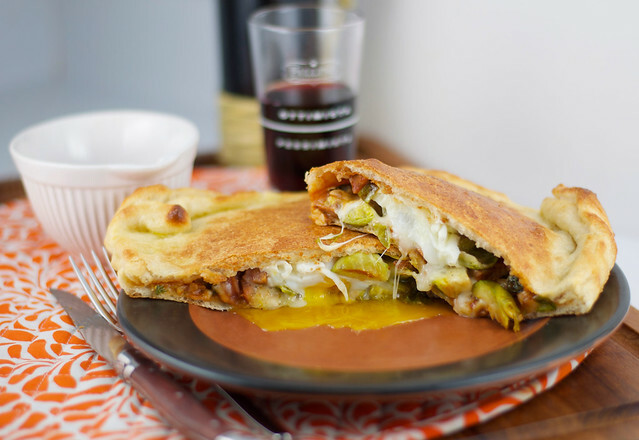 Cut each calzone in half, and serve. Makes 4 servings.